From April 13-15, the festival of Songkran is celebrated across Southeast Asia, as well as parts of India, Sri Lanka, and China. The name comes from the Sanskrit word saṃkrānti, which literally means “astrological passing.” This is because the sun enters the constellation of Aries at this time, the first sign of the zodiac. As April is the hottest month of the year in most of these regions, the celebrations culminate with a massive water fight to cool things down and welcome in the rainy season. Taking part in this traditional festival is an experience not to be missed if given the chance. In fact, it’s so much fun that after joining the festivities on Ko Pha-Ngan, I headed to Southwest China the very next year to do it again. 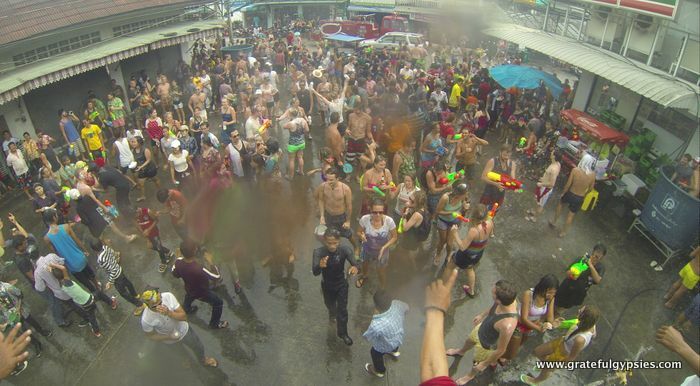 Here are some highlights of getting wet and wild during Songkran in two different countries. A parade passes by during the 3-day festival. Over the 3-day celebration, Thais all over the country will head back to their hometowns, spend time with family, make temple visits, take part in parades, and of course, get absolutely soaking wet during epic water fights. Here’s a brief run-down of the celebrations in Thailand. The first day of Songkran is also Thailand’s National Elderly Day, so young people all over the country will visit their elders to pay their respects and ask for blessings in the New Year. In this ritual, the young people will also pour fragrant water into the palms of their elders. In some towns and cities, you can also see a parade on the first day of the festivities. 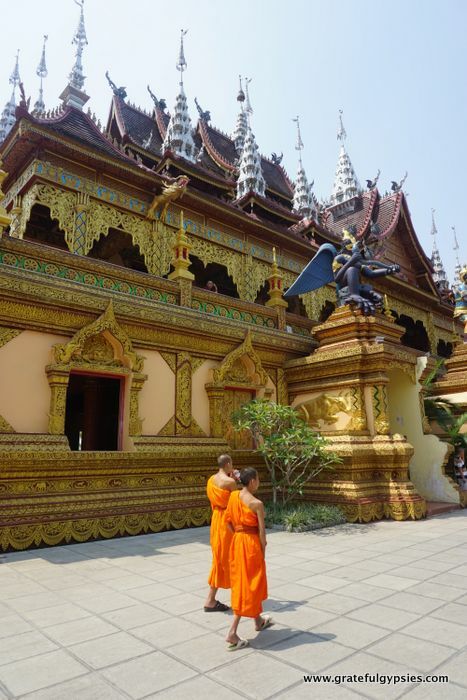 In the morning, most people will pay a visit to their local temple to make merit by giving alms to the monks. There will also be a ceremony to bathe the Buddha. This can be done both at a temple and at home – basically wherever there is a Buddha image. The second day of the New Year is also National Family Day in Thailand. Similar to Christmas in the West and Spring Festival in China, Songkran is a time for family reunions. Whether you like your crazy uncle or not, you’ll probably have to spend some time with him. 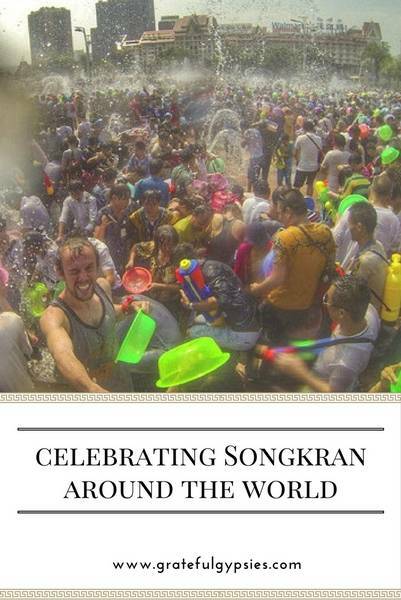 There’s not much to see the third day that’s any different from the first two (temple visits, making merit, gathering with family members), so let’s talk about the most famous aspect of Songkran – the epic water fights. Having visited elders and washed the Buddha, the last day is time for fun. People line the streets with buckets, hoses, and squirt guns – anything that can be used to soak passersby. Aside from the obvious relief water provides from the intense heat of April in Thailand, this is also symbolic of washing away any misfortunes from the past year. We were fortunate enough to find ourselves on Ko Pha-Ngan one year during Songkran. In the morning, we filled up our water guns and headed to the downtown area of the island. People drive around all day in truck beds with huge buckets of water and a variety of water guns to soak those on the side of the road. We fought back as best we could, sneaking up on trucks and spraying people before they could get a chance to reload. 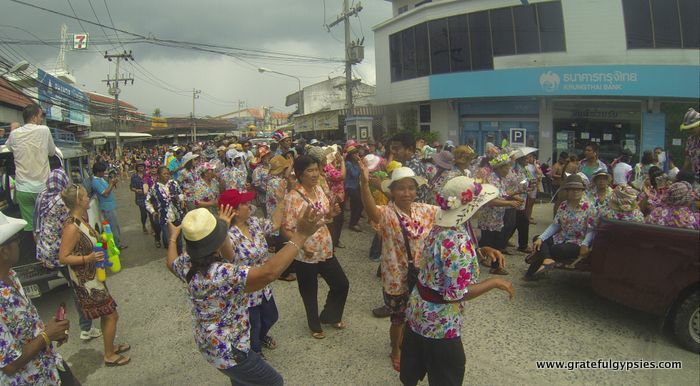 Thai people love to party, and their energy was infectious during the celebration – you just can’t help but dance along. Thai ladies in colorful flowery shirts were busting some serious moves in the street as elaborately decorated trucks with beauty queens passed by. 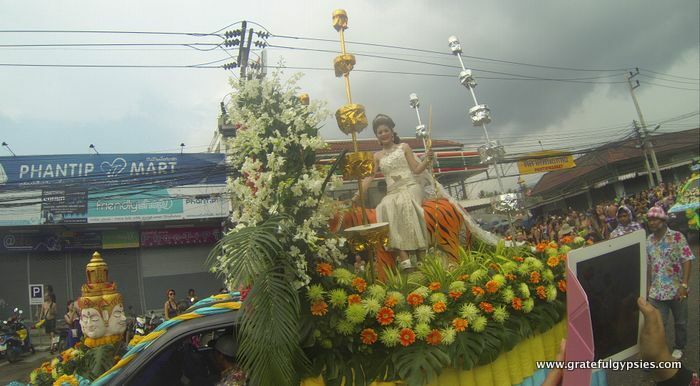 A Songkran parade passes through. Eventually the parking lot next to the 7-11 became the center of the action, with a DJ and a stage set up for people to dance on. The beer and buckets were flowing, everyone was sopping wet, and we were all grooving to the music. A huge (and wet) party. Things finally started to wind down around sunset when everyone was soaked, drunk, and tired. While the Songkran celebrations up in Chiang Mai are definitely the most famous, you can have a good time no matter where you end up in Thailand. Yunnan province is one of the most ethnically diverse places in China – among the country’s 56 ethnic groups, 25 reside here. 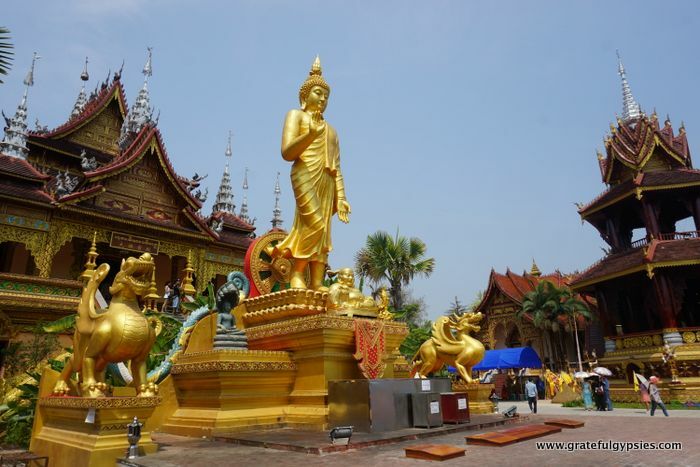 One such group is the Dai, who live primarily in the southern region of Yunnan known as Xishuangbanna. As they’re closely related to Thai people, they also celebrate the New Year at this time. Known as the Water Splashing Festival, it’s a wild three days to say the least. 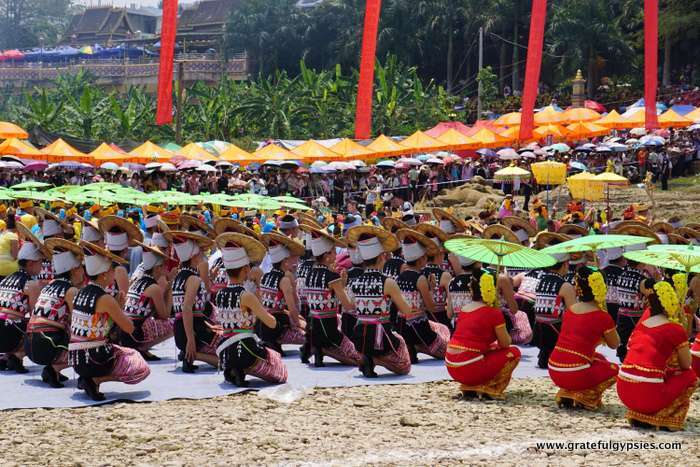 On the first day, the festivities are centered around the Mekong River in the city of Jinghong. Along the riverbank, there are various BBQ stalls, make-shift photo studios, carnival games, and souvenir shops. A colorful parade makes its way through the town and down to the river for a grand opening ceremony. The opening ceremony in Jinghong. Next up are the incredible dragon boat races. 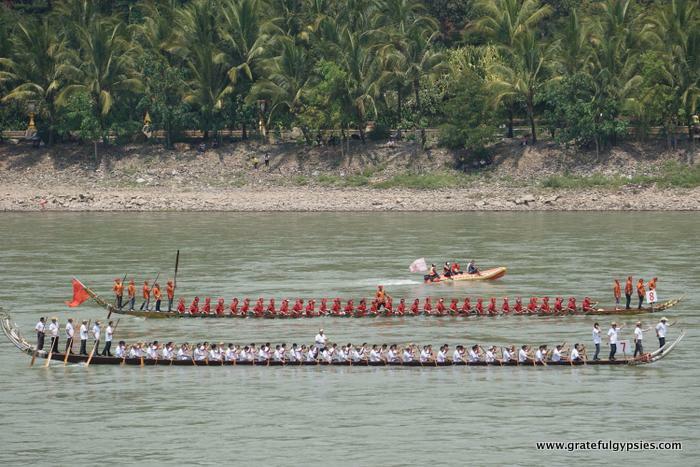 Huge teams dressed identically in traditional clothing paddle massive wooden boats up the river racing two at a time. A few people stand on the back, most sit in the middle and furiously row, and a few dance at the front. In the middle, a leader guides the rowers with a drum or gong. The races can be quite intense, not only on but off the water as well – huge crowds jockey for position with selfie-sticks raised high to get that perfect WeChat picture. Dragon Boat races are pretty epic. 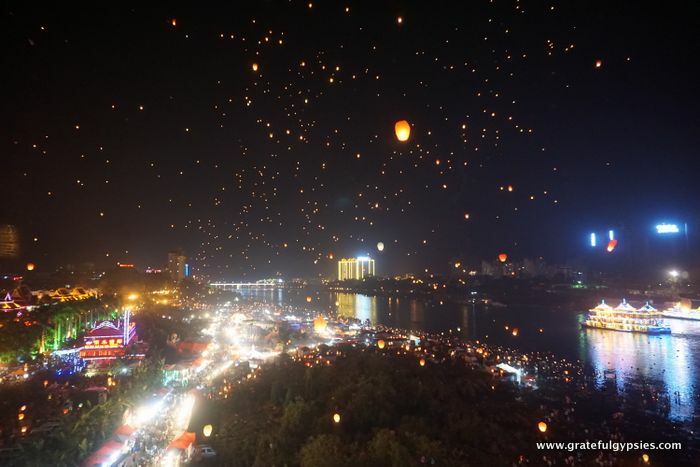 At night, the crowds descend on the banks of the mighty Mekong yet again, this time to release hundreds of lanterns into the sky. This is thought to drive away bad luck and bring in the good, and it’s quite the sight to behold. Wow. Just look at that! 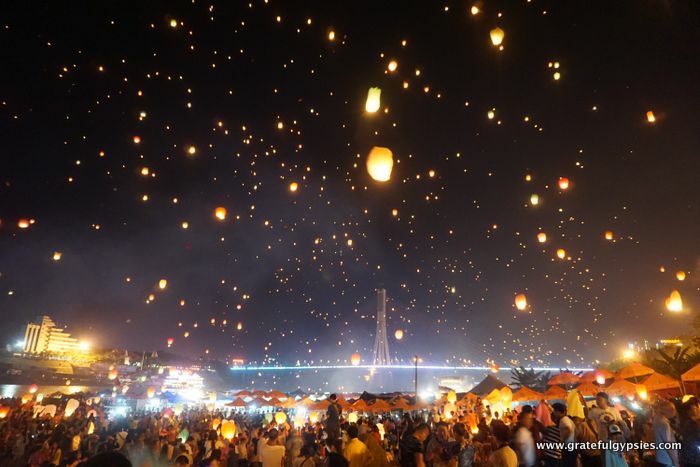 While I’ve seen plenty of lanterns sent off traveling in SE Asia and even at American music festivals, nobody can top China when it comes to sheer numbers. As with Thais, Laotians, and their Shan brethren in Myanmar, the Dai people are Buddhist. Generally, high ranking monks will lead a special ceremony in a local temple in the morning. Throughout the day, people come to the temple to wash the Buddha image, often with scented water. At the temple on Day Two. Monks strolling by the temple. 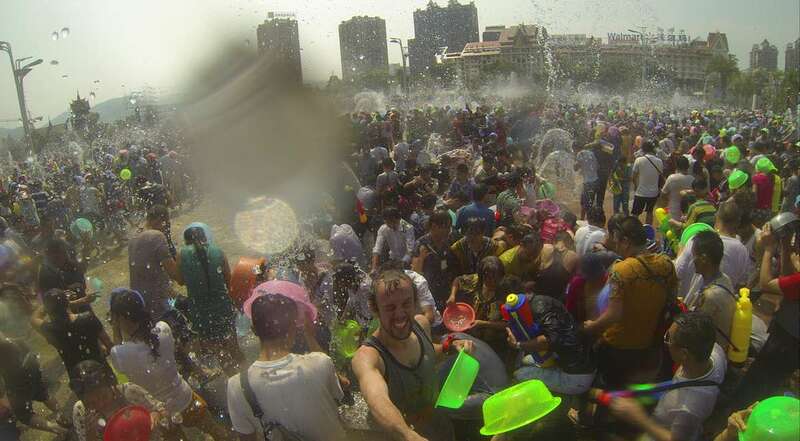 On the final day of the festivities, everyone hits the streets armed with buckets, squirt guns, and water balloons in what just might be the biggest water fight on Earth. No one is safe on the road, and you can even be hit from above by locals hanging out their window. 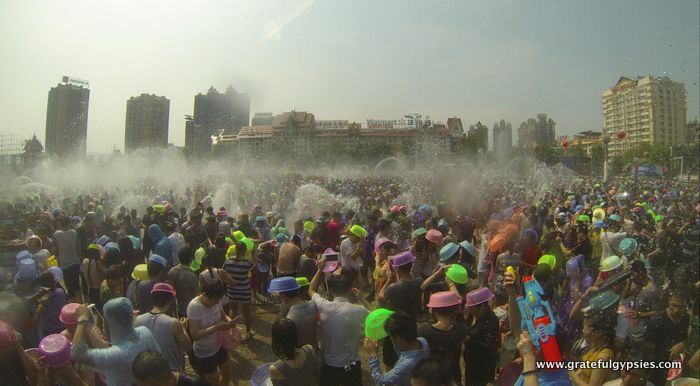 In Jinghong, revelers gather by the thousands at the Water Splashing Square to get soaking wet. There’s also a bit of a song and dance show going on up front, and even the host, dancers, and police on the stage are all targets for splashing. You’re gonna get a little wet here. Having just experienced the festival in Thailand the year before, I thought I knew what to expect heading to Jinghong. Nothing could have prepared me for the madness of this festival in China, though. Once again, the sheer number of people here is just overwhelming. 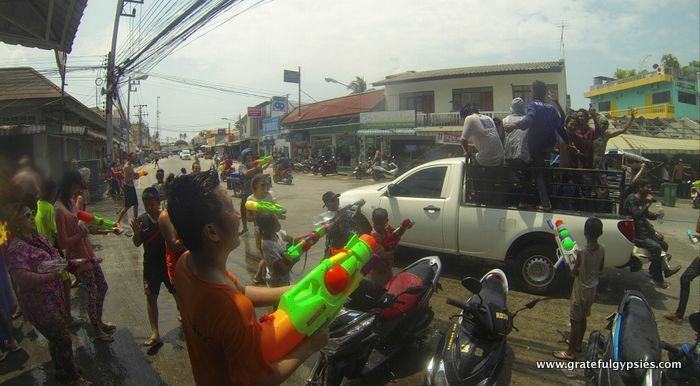 Whereas the water fight was mostly between those on the side of the road and those driving by in Thailand, this was a free-for-all of everyone for themselves. On Ko Pha-Ngan, the water fighting is just a part of the party, as there’s also a parade, a DJ, and people selling drinks. 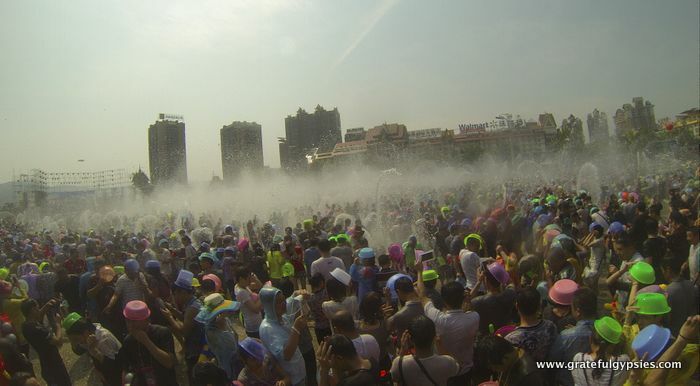 In Jinghong, however, the entire focus is on the splashing. It was fun for a while, but after two hours I was drenched, had ears and eyes full of water, and a vicious sunburn. I’m glad I went and got to experience this festive celebration in Yunnan, but I think I’ll head back to Thailand for it next time. Whether it’s in Thailand, China, or one of the other nearby countries that celebrates Songkran, we’d highly recommend adding it to your travel bucket list. Have you celebrated this festival anywhere? Leave a comment and let us know! Im seriously disappointed in myself for never having heard of this! Top of the bucket list. Thanks for reading, Sandy! And yes, crazy uncles are everywhere :). This looks so fun! Most of my travel has been in Latin America, and I love the people and culture there. Now, you’ve got me wanting to visit Asia! Great write-up and pictures! Well then maybe you can give us some tips! Latin America is next on our travel agenda. We’re currently living in Mexico and are planning on going to Guatemala and Colombia this year. Thanks! Thailand is so cool. You’ll love it! Would love to be a part of songkran! Maybe next year? Hey Ben! Thanks for reading! We’re always down to go back to Songkran. Let us know if you’re heading there! Asia hasn’t had much draw for me and my family…but posts like yours make it alluring. There obviously is so much of the world yet to discover, and fun festivals makes every culture so fascinating. Festivals certainly give you an insight into a country’s culture. I hope you and your family make there some day! Dancing lanterns, water sprays, wiggling your body, smiling, spiritual temples and cold brews?! Didn’t know such a thing existed in Asia! Asia is full of surprises! I have not had the pleasure of visiting any location in Asia yet, but this post REALLY makes me want to pack up my bags right now and GO! Thank you for the detailed descriptions to make the festivities sound so enticing! OMG everything about this post made me want to pick up my backpack, walk out my front door and get on a plane to South East Asia. I haven’t been there for songkran, but this looks like so much fun!!! I’d love to go to Songkran – I’ve been to the Loy Krathong festival which is beautiful. Some really nice photos of the floating lanterns you have on here. Thank you! Songkran is a lot of fun. We can’t wait to go back! I showed this to my kids (we’ve gone to a little Buddhist temple a few times) and now they are begging me. Along with about a million other places. Love this! Ready for more. Sorry not sorry! Lol 😀 They would have a blast there. Thanks for reading! 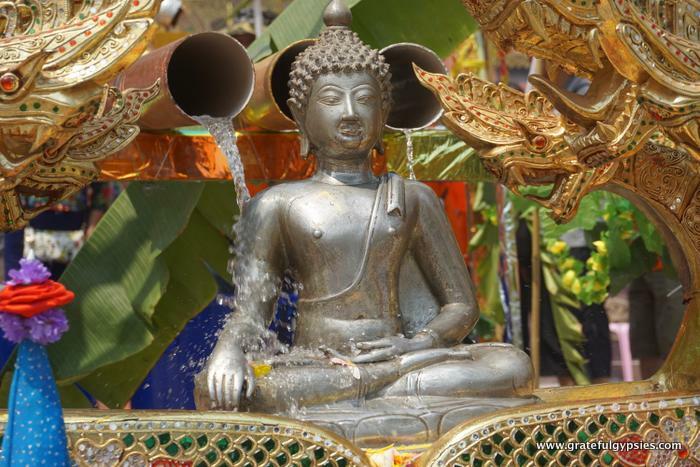 I’ve just done songkran in Chiang Mai (and it’s so much fun) but this looks amazing! I’ve heard it’s really crazy in Chiang Mai and the water throwing lasts for days! Ko Phangan was a lot of fun too, though it was a little more chilled out that I would prefer it. China is just crazy! It’s a sight to behold for sure!